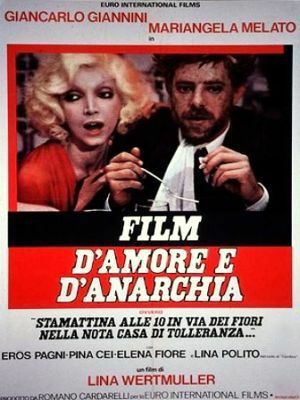 string(111) "Film of Love and Anarchy, or This Morning at 10 a.m. in Via dei Fiori in a Well-known House of Prostitution by "
Plot: As the credits role at the end of Love and Anarchy, anti-fascist director Lina Wertmüller quotes Italian anarchist Errico Malatesta: “I would like to stress my horror at these attempted assassinations. These acts are both evil and stupid as they harm the cause that they are meant to serve… But those assassins are also saints and heroes… When their extreme gesture is forgotten, we shall celebrate the ideal which inspired them.” The film — which is neither agitprop nor melodrama — opens with provincial Antonio “Tunin” Soffiantini (Giancarlo Giannini) learning that his friend, an anarchist plotting to assassinate Benito Mussolini, has been killed by Mussolini's fascist police. Tunin takes up the cause for which his friend died and enters a prestigious Roman brothel (where blackshirt clients are entertained, including the vicious police chief Spatoletti). Here he meets and has a sexual liaison with Salomè (Mariangela Melato) who explains that her reasons for helping in the assassination plot was that her former lover was beaten to death by Mussolini's police in Milan. SPOILER ALERT! Salomè arranges for her, Tunin and Tripolina (Lina Polito), another prostitute at the brothel, to spend the day with the brutal Spatoletti, Mussolini's police chief. The four go to the countryside outside Rome where the assassination is scheduled to take place a few days' hence. Salomè keeps Spatoletti busy while Tunin scouts out the area and makes his plan. Tunin, however, falls in love with Tripolina and convinces her to spend the next two days with him before the assassination, fearing they may be his last. Tripolina has to wake Tunin early on the morning of the assassination, but knowing he will die she chooses to let him sleep. Tripolina and Salomè argue about this but in the end they decide to let him sleep. Tunin wakes up and is furious at both of them, thinking he has been betrayed he goes into a tirade and confronts the police who are, coincidentally, downstairs checking the brothel for administrative reasons. Tunin launches a shootout screaming that he wants to kill Mussolini and is captured and, ultimately, beaten to death in a police cell. apparently on the orders of Mussolini himself. The film ends the way it began showing the full title of the film "Stamattina alle 10, in via dei Fiori, nella nota casa di tolleranza..." This morning at 10, on Via dei Fiori (Flowers Street), in a noted brothel which is the headline of an unnamed newspaper. The article, displaying fascist censorship, goes on to say that Tunin (who is unnamed) was arrested and then committed suicide by banging his head against a wall.